The Rhône twists and turns down the map in a sinewy slalom of picturesque villages and steep terraced vineyards, these clinging to the sides of the valley and offering up some of the greatest, purest expressions of Syrah (in the North) and blends that involve the great grape in mergers with others (Grenache and Mourvèdre, mainly) in the South that find no peer in the world. The North is divided into communes for your ease of drinking pleasure (it doesn't take long to know your Côte-Rôtie from your St Joseph), while in the south, the mere utterance of the phrase Châteauneuf-du-Pape has everyone rushing for their rusticity descriptors. In between there are the wondrous Côtes du Rhône wines, and, worth mentioning too, some whites of pure delight, be they the floral fragrances of a heady little Muscat Beaumes-de-Venise, or the headrush of lush apricot and crème frâiche that signals another wonderful Condrieu. 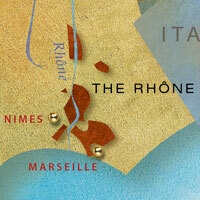 If there's a 'something for everyone' region in 'something for everyone' France, the Rhône is it.